BareFoot modular seating: The newest upholstery group from IN HOUSE. Originally designed for an historic West Coast recording studio, The BareFoot is both modern and international in appearance and with its deep seat it is universally comfortable as well. The Barefoot comes with down filled back cushions and poly blend Dacron wrapped seat cushions. Its classic hardwood frame construction sits on stainless steel "pods". Comprised of three standard elements: corner module, armless chair / sofa module, and ottoman, the Barefoot is completely customizable and can be specified as a sectional or as individual "stand alone" pieces. The modular BareFoot will comfortably fit any contract or residential space. 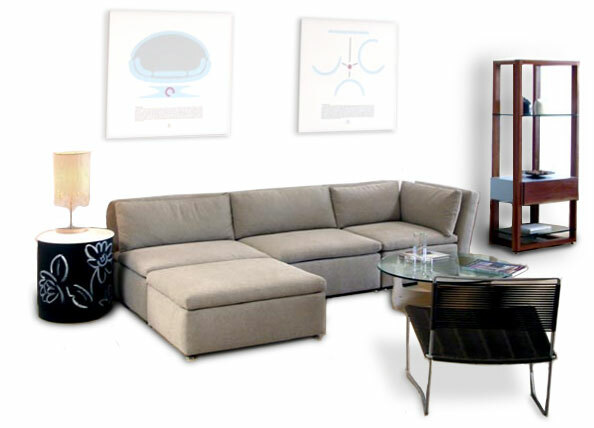 The BareFoot Sectional is available from our online store.